But you don’t have to be big to deliver big digital experiences. At 6AM Marketing, we work with banks and credit unions every day to create the most efficient and user-friendly online and mobile banking experiences. We employ three key rules for engagement. First, your mobile platform should seamlessly integrate with your online experience. If your website is not responsive you absolutely, positively must update that TODAY! As a consumer switches back and forth between mobile and online, they should feel as if the two experiences are connected, like parent and a child. Second, you don’t need 1000 features in your app to provide a great experience. The basics are just fine if they’re functional. Focus on the transactions that are critical to your user’s success. For example, a commercial customer is going to need different features than a personal consumer. Don’t get caught up in all the bells and whistles, just be consistent, timely and maintain your client’s security. Third, eventually your clients will need to speak to a human being. Regardless of how technically savvy your consumers are, eventually they will need to call the nearest branch or your call center. Great technology backed by great customer service ensures that, when there is a question or concern, you’re reaching that consumer and building trust. Using hot links to dial instantly from your app, within your online banking from a smart phone and clearly displaying your contact information at all times will alleviate the initial frustration for the consumer. You know that old adage: Keep it Simple. 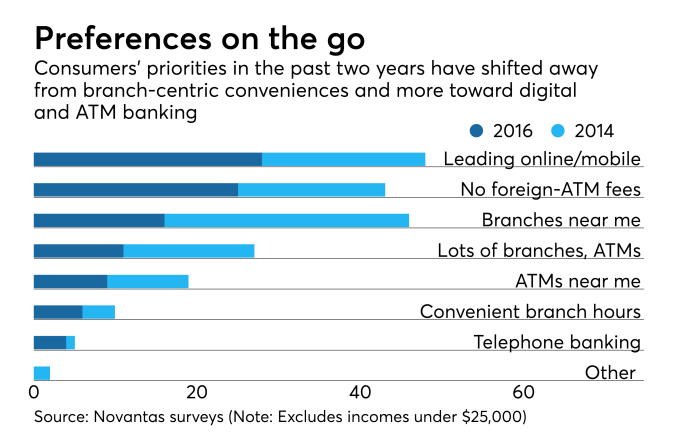 It still rings true for digital and mobile banking. As long as you keep in touch with your consumer’s needs, your services will remain relevant today and into the future. Who knows: ATM’s, like land lines, may quickly become a thing of the past.